I know this probably makes me a bad person, but I hate you. Well not all of you, just those of you from the Northern Hemisphere. I don't hate you anymore, it was just for the last 3 months. And hate may be too strong a word — I envy you. You with your bright, gloabally-warmed summers, frolicking fancy-free under the same sun that has shunned me and my upside-down kin. Well well well, haven't the tables turned? Sure it might be raining outside here while you ease into a mild Autumn, but it's spring now and ain't no one gonna take that away from me. Daylight savings has started, and thankfully no one told the spring produce about the dreary weather. This means two things. First, it means that more often than not I'll be eating dinner (and hence photographing dinner) while it's still light, making for brighter, more natural pictures. Secondly, not only will the photos be brighter, but the food itself will be brighter. Juicy tomatoes, mangoes, fresh basil, outdoor grilling, that kind of thing. It's going to be great. All throughout winter I look forward to cooking broad beans in spring. It's silly because I'm actually rather indifferent towards fresh favas, but my affinity for them is symbolic. These days you can get tomatoes in June and strawberries year-round, but fresh broad beans are never available out of season — once they start appearing in the markets, I know warm weather is close behind and everything's going to be okay. This dish has fava beans declaring spring has sprung, with walnuts, guanciale and a touch of cream providing shades of the colder weather that's lingering after winter. It's perfect for this time of year, and might I add quite a handsome-looking dish to boot. One tip that I've found useful when serving and photographing this kind of pasta sauce is to cook off the larger ingredients separately and set them aside while you make the sauce. When ready eat, toss the pasta and sauce together with some of the reserved ingredients, then plate up and scatter with what remains. The ingredients don't become limp and waterlogged from simmering in the sauce (unless that's the idea) and they'll taste great and look pristine for your blog. 1. Cook the orecchiette in salted, boiling water according to the instructions on the packet. Meanwhile make the sauce. 2. Pu the guanciale in a cold pan and place the pan over a medium heat. Saute until it starts to become crispy around the outside, then remove to a bowl, leaving the rendered fat behind. 3. Add the garlic to the fat and cook over a medium heat for 2 minutes, then add the cream, parsley, and seasoning. Simmer for 2 minutes until it starts to thicken. 4. 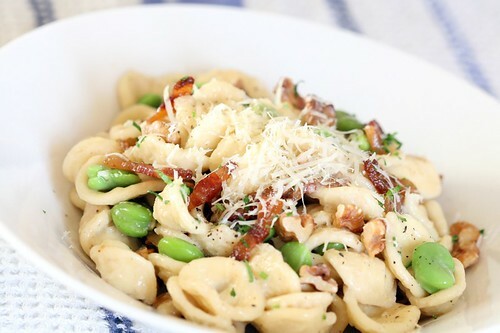 When ready to serve, toss together the sauce & pasta with most of the guanciale, broad beans, and walnuts over a medium heat until the sauce thickens and just coats the pasta. 5. Scatter over the remaining pecorino, guanciale, broad beans, and walnuts, and serve. (1) Those who have cooked with anything but the youngest fresh fava beans will know what I mean. Broad beans grow inside a pod, but the individual beans are themselves inside a second skin that can be fibrous and unpalatable. To double-peel broad beans, first remove from their pods, blanch in boiling water for 30 seconds, and cool under running cold water. They should now slip easily out of their skins. (2) You can roast these in a dry pan, in a hot oven, or as I do under the oven grill (broiler), tossing every 30 seconds until they're done (about 2 minutes). I've never been able to sleep during the day. I envy those who are able to take revitalising afternoon powernaps; these days I can barely sleep in past 8am. It's usually okay as there's always something to do (I include browsing food blogs and reading Dinosaur Comics in that), but as I attempt to reverse my sleep-wake cycle in anticipation of six weeks of night shifts it's inconvenient. The nights themselves have been an interesting exercise in keeping myself occupied. Last night's entertainment included half a season of 30 Rock, trimming the fat from my music collection, and an early-morning visit to the supermarket. You would think that being alone in a supermarket at 3:30am would be peaceful, but take away the hum of shoppers and clutter of trolleys and the muzak becomes deafening. At one point I began to stare down one of the untouched, perfectly-stocked aisles and thought about the vast capitalist machine that has turned the simple joy of eating into a system where the drive to grow profits pushes quality right off the shelves, then I caught myself falling asleep standing up and realised I had no idea what day it was. I proceeded to the self-checkout with my items. It'll be hard to cook and eat well while I'm on nights. I'm not even sure how meals work — if you wake up at 6pm do you eat cereal at dinner time? I'd like to think that I could be the guy who doesn't just scoff a box of barbecue shapes at 2am between respiratory arrests, but I'm not. What I've decided to do to keep the posts flowing is to gradually clear out the iPhoto archives. There are a number of meals that I have photographed without remembering to write down the recipe, so I'll post them here and leave it up to you as to whether you want me to make them again and post a recipe in a couple of weeks' time. 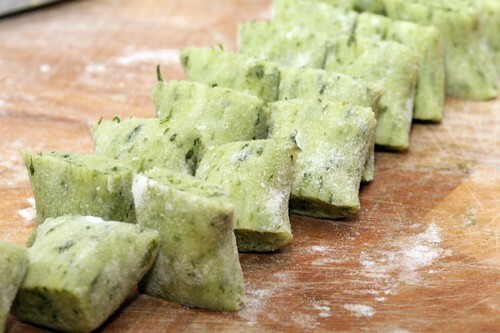 The first is this basil & potato gnocchi. I usually serve gnocchi with a simple tomato and basil sauce, and wondered if it would be possible to get the basil flavour into the gnocchi themselves. Well it turns out that with enough basil it is possible. I blended one bunch of basil and chopped it through potato gnocchi made the usual way. I served them with Marcella Hazan's tomato sauce. You do know about Marcella Hazan's tomato sauce don't you? 1. Combine everything in a saucepan and simmer gently for 45 minutes. 2. Remove and discard the onion halves. Crush the tomatoes with the back of a fork (or blend quickly with a stick blender), adjust seasoning, and serve. As far as the Second Pancake is concerned, Tim is the Michelangelo of cooking. Everything's in perspective. He delivers beautiful, balanced, and truly satisfying food. The metaphor will make even more sense when he puts up his recipe for marble cake (you'll need a chisel) or the rhubarb pie he can only make over the course of several years lying on his back at the top of a chapel. I, however, am more along the lines of Jackson Pollock. I've got all the disorder, chaos, and mess of his work (though very little of the beauty, orchestration, or design). It is for this reason that you'll never be getting a recipe for soufflé or risotto from me. Minestrone, on the other hand, is right up my alley. It's a mongrel of a soup, the old 'strone. A dog's breakfast. And, in the more literal sense, a human's lunch. My lunch, in fact. It's perfect for winter days when it's too cold to go shopping, you're too tired to put in much effort, and two carrots are poking their heads out of the crisper, begging to be used before they turn into sad, sorry, spongy semblances of their former selves. I'm sure there is, in some arcane tome, the original recipe for minestrone. I'm sure at one point it was possible to say what is and what is not minestrone. No more. The way it's going now, I'd be hard pressed to find a reason why a sock in a bucket can't call itself part of the long line of mighty and miserable minestrones. And that's just how it should be. Do you have water, a turnip, tomatoes and cumin? Hey, throw it in a pot and call it minestrone. Celery, lentils, and limes? Why not? Minestrone. All this being said, I guess there are a few guiding lights for the minestrone faithful. Tomatoes are usually a good bet, plus some kind of beans, and I guess a bit of pasta and some veggies wont go astray. The beauty being that you have infinite capacity for experimentation. Is your pantry carrying carrots? Chop 'em up and toss 'em in. An abundance of asparagus? An excess of eggplants? A profusion of peas? A copiousness of courgettes? An oversupply of aubergines? A bounty of beans? A tendency to overdo simple alliterative wordplays? Whatever it is, let the magical gods of minestrone turn it into something delicious. few toasted pine nuts, and start dipping thick slabs of buttery toast into your new concoction. The rest of the soup (you did make fifteen litres or so, right?) can go into every tupperware container you've got, thereby giving you delicious winter lunches for the next week. your own stock, all the better. Why didn't anyone tell me you could microwave potatoes? Here I was making gnocchi, feeling hungry and impatient while my potatoes baked or lazy and compromising while they boiled, while this whole time I could have been zapping them and saving the fuss. It's perfect, really. Unlike baking the potatoes are thoroughly cooked in less than 10 minutes, and unlike boiling you're not adding any horrible, dreaded water. Here's how it's done: Clean your potatoes and leave their skins on (I've switched from sebago to desiree potatoes for gnocchi, by the way), then pierce four times with a sharp knife. Don't skip this step or your potatoes will explode. Place in a microwave safe dish and cook on high. Cook for 6 minutes for 1 potato, adding 2-3 minutes for every extra potato. Once finished, leave in the microwave to rest for another 5 minutes. Congratulations, your potatoes are cooked! 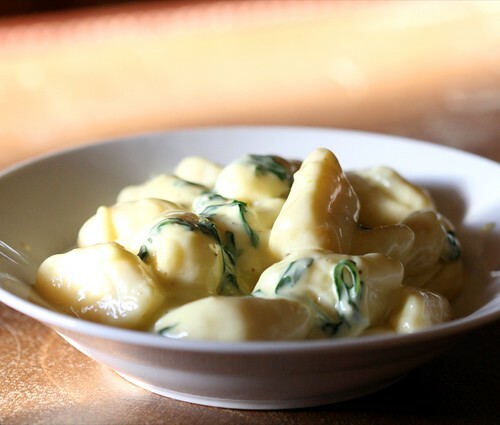 In this case I used my totally rocking mashed potato to make gnocchi with gorgonzola and rocket. The gorgonzola sauce simple but extremely rich, so be careful not to reduce the cream by too much. The rocket seemed like a good idea in my mind, but I'm not convinced it adds much. Fresh or barely wilted the texture is a little harsh, but cook it any further and it loses a lot of flavour. My recommendation: leave it out. 1. Cook the garlic and bay leaf gently over a low-medium heat in the butter for 4 minutes. 2. Add the cream and a splash of water and bring to a simmer. Reduce by a quarter, then remove from the heat and break up the gorgonzola into the sauce. Season with white pepper, garnish with truffle oil, and stir. (1) A little goes a long way — 30g should be plenty for 1 serving. Many of the best pasta sauces can be made in the time it takes to cook the pasta, so to be able to prep, cook, and wash up by the time it reaches al dente is something extra special. Spaghetti with garlic and olive oil is exactly what it sounds like, but this incredibly simple dish is more than the sum of its parts. Still, that's no reason to skimp on the parts. When you're cooking with so few ingredients every individual component counts. The pasta should be a good quality dried durum wheat flour variety, and as for size I prefer the slightly thinner size (not spaghettini though — this would be fine, but I like the heartier texture of spaghetti). It always helps to salt your pasta cooking water, and this is a particularly important example. The final taste of this dish is as much the pasta itself as it is the sauce, so give your pasta all the help it can get. The garlic and parsley should both be fresh, but beyond that most farmer's market garlic/parsley is much of a muchness. Slicing it thinly and cooking it slowly will take much of the edge off the garlic, giving you the tasty flavour but hardly any garlic breath. Although I finish with the best quality extra virgin olive oil I can afford, to cook the garlic initially I simply use a good quality regular olive oil. Correct me if I'm wrong, but since I'm heating away many of the subtleties, I don't really see the point in using expensive oil for what is basically heat transfer. On that note, don't use too much oil. Sometimes when this (extremely margin-friendly) dish is served in restaurants you're left with a pool of oil at the bottom of the bowl. The oil should coat the pasta and nothing more, leaving the bowl more or less dry once you're finished. 1. Boil the pasta until just al dente in salted water while you cook the sauce. 2. Combine the garlic and regular olive oil in a pan and cook over a low heat for 3 minutes. Add the parsley about half-way through and continue to cook slowly for 3 minutes, making sure the garlic doesn't brown. Turn off the heat and add the anchovy, mashing with the back of a fork to dissolve it. 3. Once cooked, drain the pasta and toss in the pan with the sauce, extra-virgin olive oil, plenty of cracked pepper, and 1-2 tbsp of reserved pasta cooking water. Serve immediately. Lately I've been on a bit of an American food bender. Perhaps recent events have given me another reason to admire you freedom-loving crazies, as pulled pork, BBQ ribs, and the Rueben sandwich have all graced my table at some point over the last month. That will all get written up in due course, but today I wanted to show you my baked ziti. What other dish combines pasta, bolognese sauce, and mozzarella cheese, and still manages to remain a wholly American invention? I can feel myself reaching the limit of what 6 seasons of The Sopranos taught me about baked ziti, so to avoid looking like a fool I will stop right there. The recipe below is for an individual serving baked in a bowl — which is convenient when you're cooking for one (cue the violins) — but it could just as easily be scaled up to fill a whole casserole dish. And just to be parochial, it uses the warm weather bolognese I wrote about the other day. Now I'm no Italian-American, so I would love for someone who knows what they're talking about to tell me how I've butchered their classic*. Who knows, maybe one day I can make a batch that even Livia wouldn't criticise. 1. Preheat an oven to 180ºC/350ªF. Combine all of the ingredients except the cheese, and adjust seasoning. Transfer this to an oven safe bowl, scatter generously with grated mozzarella, and bake until golden on top. 2. Pat yourself on the back for freezing batches of bolognese sauce. * It just occurred to me that my so-called baked ziti contains no ziti. You may remember my version of ragu alla bolognese from a few months ago. It was quite a big deal, in all the papers. That was in the middle of winter, when a hearty, rich meat sauce over fresh pasta was the perfect comfort food. Now as I look down the barrel of an Australian summer, long slow braises, as good as they are, are making way for lighter, brighter foods. This bolognese is more 'southern style' — by which I mean Naples rather than Louisiana (and by which I mean Naples, Italy, rather than Naples, Florida) — but once again I would not be so foolish as to claim authenticity. While my meat bolognese had depth of flavour with many different flavours melting together, this sauce has lots of clear individual tastes. Everything is left relatively chunky so you get individual bursts of flavour in eat bite, and the amount of tomatoes make it as much a tomato sauce as a meat one. Some chillies for kick and anchovies to round it out, and you're in business. 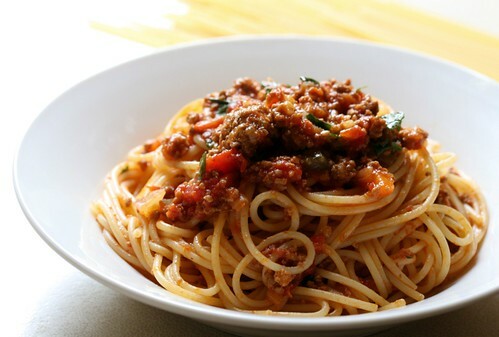 Unlike my other bolognese this works much better with dried pasta. I also make bulk and freeze it, so rather than putting fresh herbs into the sauce and dulling their flavour in the freezer I tend to instead toss them freshly-picked together with the pasta and sauce before serving. 1. In a wide pan, heat 3 tbsp of olive oil to a high heat and add the mince and some salt. Cook until the mince is well-browned, breaking up the mince so there are still some medium-sized chunks. 2. Add the wine and scrape the fond off the bottom of the pan while it sizzles. Turn the heat down to medium, ten add the onion, carrots, celery, and garlic and put a lid on the pan to let the vegetables sweat. 3. Add the anchovies, chillies, and tomatoes and bring to a high simmer. Grate the nutmeg over the pan, then reduce the heat to low and cover. Cook this for about 35 minutes or until the vegetables are completely tender, then salt to taste. The other day I got into an argument with a friend's girlfriend about the merits of fresh versus dried pasta. Earlier in the week I'd sat in stunned silence as an acquaintance lectured me about how global warming was a conspiracy, but the topic of pasta is not one that I take flippantly. Her claim was that fresh pasta is always better than dried pasta, which is no more than a cheap, easy alternative used only out of convenience. Don't get me wrong, I love fresh pasta. I love making it, cooking with it, eating it, and although the opportunity has never arisen, were I to stumble across a bathtub full of it I would seriously consider putting on some Amy Winehouse and reclining. But it is by no means always better. Nor it is uniformly worse. 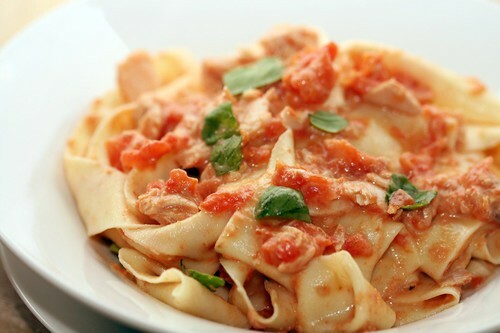 Rather, fresh and dried are but two types of pasta, each with their own strengths, weaknesses, and uses. Fresh pasta is dainty, delicate, and hates to cause a scene. Around a domineering crowd it can be a bit of a pushover, but those who are willing to listen will find it really is excellent company. 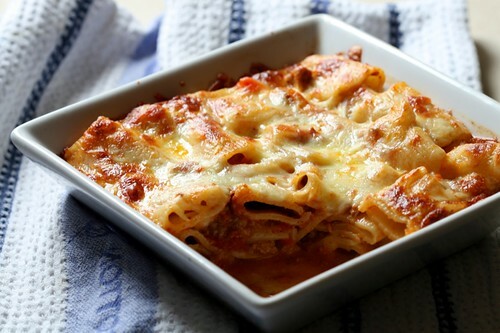 It pairs well with cream based sauces that won't overwhelmed the subtle egg flavour of the pasta, or as a discreet but solid delivery system for rich sauces with deep, warm, complex flavours like a meat ragu. 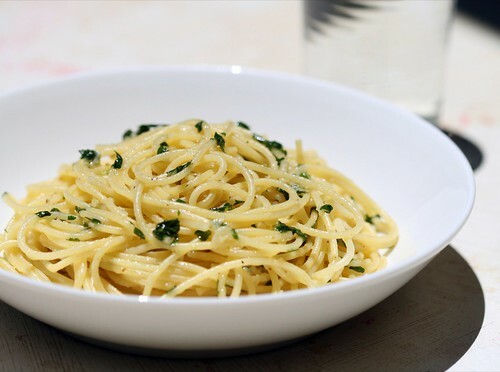 Alfredo is the kind of sauce that fresh pasta does best: it's buttery and luxurious, so it's only fitting to serve alfredo sauce with a pasta that's equally easy and comforting to eat. Dried pasta is a little more rough around the edges. It's tough, assertive and doesn't take any crap, but behind all of that it's loyal and has true character. You might be embarrassed to introduce it to your more 'proper' friends, but you know that if you were ever in a fight it'd have your back. Dried pasta will hold its own with sharply-flavoured sauces like a spicy, salty bucatini all'amatriciana, but its earthy flavour and al dente bite will shine just as much dressed simply with garlic and olive oil. No dish better illustrates the strengths of dried pasta than puttanesca — the pungency of the sauce would walk all over anything lesser. Use this as a guide, not a rule book. That's another way of saying that if I break my own rules, don't harass me. I still can't decide whether I prefer carbonara with the more traditional dried pasta or with fresh — the two are completely different dishes and it depends on what mood strikes me. As always, all you can do is go by your own taste. In return for reading my rant, I offer you this recipe. As far as the pasta-matching wankery is concerned, the sweet tomatoes & basil and touch of cream round out any strong saltiness from the tuna, making it an ideal sauce for the fresh pasta I've used here. Be sure to use the best quality olive oil-packed tuna, which really is night and day compared with the typical supermarket junk. 1. Sauté the garlic in olive oil over a medium-low heat until it softens (don't let it brown). Add the tomato and cayenne pepper and turn the heat up to medium-high, cooking until the tomatoes break down. Mash them to a pulp with the back of a fork. 2. Stir in the tuna and cream, salt to taste, and remove from the heat. 3. Meanwhile, boil the pappardelle. When it is done, drain and add it the pan with the sauce. Add the torn basil leaves and toss over heat to combine. Serve. (1) I made 1 egg's worth of pasta from this recipe, cutting it into thick strips to make pappardelle rather than passing it through the pasta machine's fettucini cutter. One of the troubles with cooking for one is keeping costs down whilst avoiding repetition. A leg of lamb is delicious and more economical than most other cuts, but once the initial roast dinner is over it's each to get sick of lamb sandwiches all week. As good as risotto and pasta are at incorporating last night's leftovers, it's hard to shake the fact that you're eating the same thing you ate last night tossed through a bowl of penne. This was the situation I found myself in last week, with an impulsively-purchased leg of lamb, a large batch of olive tapenade, and some mashed potato. The challenge was to create two distinct dishes from more or less the same ingredients, and at the risk of sounding too proud of myself I think I did pretty well. Dinner number one was roast lamb with skordalia and a minted olive dressing. I regret not writing down the specifics, but I can offer a general outline. First the lamb: Make a marinade of greek yoghurt, honey, crushed garlic, dried oregano, chopped mint, and salt. 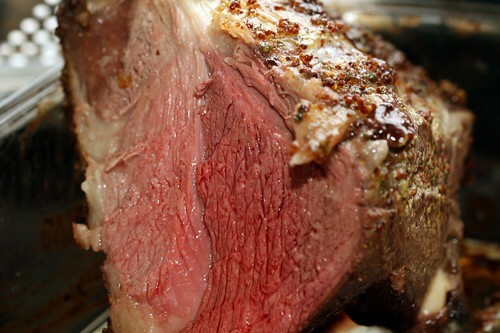 Rub this over the a leg of lamb and roast in a 220ºC/425ºF oven for 20 minutes, before reducing the heat to 160ºC/320ºF and cooking until the internal temperature of the lamb reads 70ºC/160ºF. Meanwhile, boil some potatoes, then drain well and mash with crushed garlic, salt, a squeeze of lemon juice, and a liberal amount of olive oil. To make the dressing, combine equal parts olive tapenade and extra virgin olive oil with some finely chopped mint. 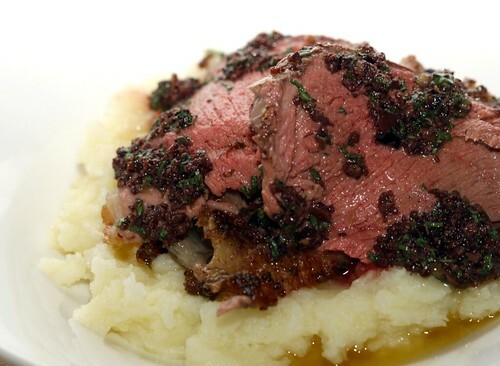 To assemble, top portions of skordalia with slices of the rested roast lamb and drizzle with some dressing. For dinner number two I picked over the bones of the lamb roast to make potato gnocchi with a lamb & olive ragu. 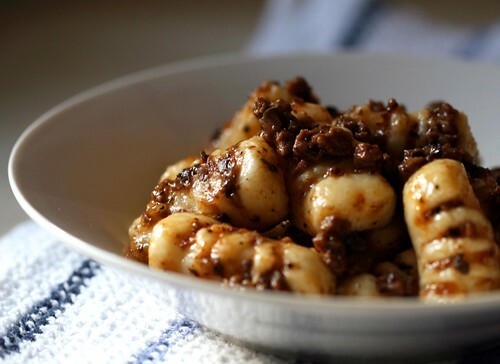 The gnocchi I've written about before, and the ragu recipe is below. It's meaty and very savory thanks to the olive tapenade, and goes well with grated parmigiano reggiano and finely shredded fresh mint. I used leftover roast lamb, but if you're making it from scratch, substitute lamb shoulder. 1. Heat the olive oil to a high heat, then add the lamb and cook until it is well-browned. Remove and reduce the heat to low. Sauté the diced shallot and garlic with the bay and oregano until the onion is translucent. 2. Add the tomato paste, diced tomato, and cook until reduced to a pulp. Return the browned lamb and cover with water. Bring this to a boil then simmer, covered, for 1 hour or until the lamb is very tender. 3. 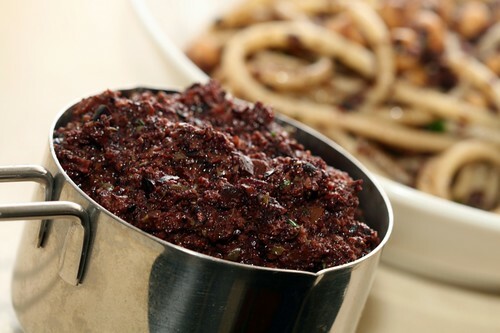 Stir in the olive tapenade, season to taste, and serve. In the background: Bucatini with olive tapenade and chickpeas. Way back in June I posted a recipe for chickpea & olive bruschetta, in which I promised that an olive tapenade recipe would shortly follow. Regrettably my good intentions were thwarted by laziness, and it's taken four months for me to make it again. There's no good reason for it to take so long — olive tapenade is quick to make, incredibly easy, and can be used in all sorts of ways. If you ask me, the simplest and still one of the best is to spread it on a thick piece of Italian country bread that's been drizzled with olive oil and grilled. It also goes terrifically with pasta (it is after all 2/3 of the way to puttanesca), and last night I thinned it out with extra virgin olive oil, stirred in a little fresh mint, and used it as a sauce for some roast lamb. Delicious. 1. Blitz everything in a food processor until well blended. I told you it was easy.